Hyde Park, according to Mrs. Alec-Tweedie, was the common heritage of all, the meeting ground of King and coster. 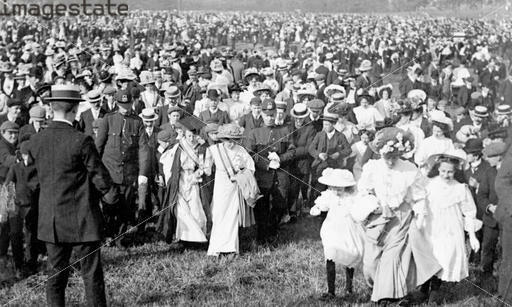 As one of London’s largest parks, it was used by all manner of people for all manner of events and gatherings from the fashionable throng along Rotten Row to loud demonstrations from activists and suffragists. The park derives its name from the name of an estate acquired by Henry VII, who converted the land to a deer park. Charles I opened the park to the general public, Charles II enclosed the area and planted trees, William III moved to Kensington Palace and laid the drive which would become Rotten Row (from Route de Roi, French for “King’s Road”), and Queen Caroline, consort of George II, formed the Serpentine. The fashionable hour for riders was from around 8 am to noon, and again–with both riders on Rotten Row and carriages on the drive–between 5 pm and 7 pm, where the aristocracy mingled with politicians, artists, actors and actresses, explorers, and judges. The only people with the right to drive carriages down Rotten Row were the King and the Duke of St. Albans, as Hereditary Grand Falconer. In 1895 cyclists received permission to ride in a portion of the park, a row dubbed “Cyclists Row,” and the Ladies Mile, on the north side of the Serpentine, was the spot at which the Coaching and Four-in-Hand Clubs met during the summer. Other fashionable hours were Sundays between one and two pm for the “Church Parade,” and at that hour on “Ascot Sunday,” where ladies displayed their new summer dresses. The most use made of Hyde Park was for demonstrations. About £8000 a year was spent on police work for Hyde Park alone, and demonstrators were required to forward information about their gatherings and marches to Scotland Yard to insure the protection and watchfulness of the “bobbies in blue.” The Mud March of 1907 was the most striking of gatherings, when “smart ladies in thousand-guinea motors, costers who were forced to leave their carts outside, factory women with babies in their arms, titled dames and girls from the slums, all marched or rode or drove in that great procession.” That same year, the Church of England began conducting open-air services every Monday night under the auspices of the Bishop of London’s Evangelistical Council, where the Bishop hoped to touch the lives of London’s neglected citizens. We turn once more to Mrs. Alec-Tweedie, who rhapsodizes over the nature in Hyde Park, exclaiming “every kind of tree is here,—the elm, the lime, the beech, the common ash, the plane, and many besides…Shrubs have been planted in endless variety, and —when the tree trunks stand out bare and bleak in winter, and the branches are leafless—give to the walks a pleasant bordering of green. The particular glory of the Park shrubs is to be found in the rhododendrons, which in the weeks when they are in full bloom are alone worth coming to London to see. She also goes on: “But, alas! the twentieth century has sounded their [carriages] knell. 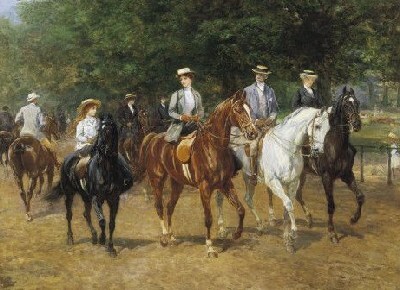 Those delightful meets held in the summer months at the Magazine in Hyde Park, when the Four-in-Hand and Coaching Club muster twenty or thirty coaches each time, drive round the Park, then off to Hurlingham or Ranelagh to lunch, are coming to an end. Motors are hustling coaches off the road, and already the two famous Polo Clubs outside London are instituting automobile races and shows, because the entries for the coaches have dwindled so terribly, while for the former they have gone up by bounds in a few years. Horses are already threatened.” Her lament was rather justified, for society columns remarked upon the near desertion of Hyde Park by fashionable society in 1910 because of the automobile. Thankfully, the next season saw a return to Rotten Row, but this was a harbinger of the decline of the horse. Great topic – the social life of well heeled Edwardian families always stuns and amazes us so-called modern sophisticates still. And I learned something new from you again, which I added by creating a link to your post. That was the fact that Rotten Row was a horse-centred society. Gradually cancel the use of horses and carriages… and you cancel the popularity of a tradition that had been going for decades. Thanks Hels! I was looking at Rotten Row on Google Maps and thought how strange its continued existence is, since it’s been abandoned by Society for decades! I know there are a few mews for anyone who wants to rent a horse to ride down Rotten Row, but the demand must be incredibly low.